Readers share the words that have shaped their lives and defined their philosophies. To add yours, send us a note: hello@theatlantic.com. I first read The Brothers Karamazov when I was 17, on a rocky family vacation. At first, it was a melodramatic Russian escape from my fighting parents’ slow-ending marriage. But then I got to the chapter “Rebellion.” I couldn’t look away from the page. It was my teenage introduction to the existential unfairness of the world. It was heartbreaking and exhilarating, depressing and empowering. Even now when I read it, my heart beats faster as Ivan breathlessly works his way up to his declaration. He feels as real to me as the impossible dilemma with which he struggles. It’s not worth the tears of that one tortured child who beat itself on the breast with its little fist and prayed in its stinking outhouse, with its unexpiated tears to “dear, kind God”! It’s not worth it, because those tears are unatoned for. They must be atoned for, or there can be no harmony. But how? How are you going to atone for them? Is it possible? By their being avenged? But what do I care for avenging them? What do I care for a hell for oppressors? What good can hell do, since those children have already been tortured? And what becomes of harmony, if there is hell? I want to forgive. I want to embrace. I don’t want more suffering. And if the sufferings of children go to swell the sum of sufferings which was necessary to pay for truth, then I protest that the truth is not worth such a price. I don’t want the mother to embrace the oppressor who threw her son to the dogs! She dare not forgive him! Let her forgive him for herself, if she will, let her forgive the torturer for the immeasurable suffering of her mother’s heart. But the sufferings of her tortured child she has no right to forgive; she dare not forgive the torturer, even if the child were to forgive him! And if that is so, if they dare not forgive, what becomes of harmony? Is there in the whole world a being who would have the right to forgive and could forgive? I don’t want harmony. From love for humanity I don’t want it. I would rather be left with the unavenged suffering. I would rather remain with my unavenged suffering and unsatisfied indignation, even if I were wrong. Besides, too high a price is asked for harmony; it’s beyond our means to pay so much to enter on it. And so I hasten to give back my entrance ticket, and if I am an honest man I am bound to give it back as soon as possible. And that I am doing. It’s not God that I don’t accept, Alyosha, only I most respectfully return him the ticket. In the ending of the Animorphs series, the titular child superheroes manage to take control of the mothership of the Yeerks—a race of alien parasites intent on enslaving all of humanity, and the Animorphs’ main antagonists. At this moment the Animorphs’ leader, Jake, considers whether to massacre the Yeerks aboard by flushing them into space. Seventeen thousand. Living creatures. Thinking creatures. How could I give this order? Even for victory. Even to save Rachel. How could I give this kind of order? They could have stayed home, I thought. No one had asked them to come to Earth. Not my fault. Not my fault, theirs. No more than they deserved. Aliens. Parasites. Subhuman. Having spent over fifty books watching the noble Animorphs fight the Yeerks, I had internalized a deep hatred for them. At the time I first read this, I full-heartedly agreed with the decision to massacre them, despite the fact they posed no longer posed a threat. Later, after some reflection, both Jake and I reconsidered the moral stakes, and regretted the moment’s extreme vitriol. This passage stuck with me because it pointed to a dark part of my own soul. It was a jarring picture of how noble causes can turn horrible so quickly, and how easy it was to internalize hate and dehumanize enemies. An important lesson, and one that really shattered my confidence that I was an inherently good person. In high school, I discovered Stephen Chbosky’s The Perks of Being a Wallflower, and I still maintain that it was the best discovery of my life. It’s about angsty teens in Pittsburgh (my hometown) trying to make sense of their surroundings, friends, family, and themselves as they plan for high school graduation and college. It fit me almost too well. As a bored, middle-class suburban kid, I always wanted to get out of this town and pursue my own life outside of the social constraints of my high school and the family obligations at home. I always felt tied down and held back, never able to fully break away from the rut I was in growing up. This was magic to me as a 16-year-old. It very simply told me that no, I can’t change where I’ve been and who I’ve been in the past, but I can change myself going forward, and I don’t have to feel guilty about it. We all have our pasts, but we are the captains of our futures, and that is so powerful to hear as a kid stuck in the suburbs. I could write about the significance of this moment academically; I could talk about the meaning in the choice to accept life’s lows as part of the beauty of the human experience; but I don’t want to. I don’t want to approach this with detachment, I just want to feel it. And I have felt it; I can’t get it out of my head. I've thought about it for years. It’s become such a bone-deep part of my understanding of the world that I couldn’t imagine forgetting it. If you’ve got a passage you can’t forget, please send it our way: hello@theatlantic.com. Tell Us: Which Literary Passage Most Defines You? She did not know what he had done ... but she felt it in him all the same. They only mumbled at each other on staircases; they looked up at the sky and said it will be fine or it won’t be fine. But this was one way of knowing people, she thought: to know the outline, not the detail, to sit in one’s garden and look at the slopes of a hill running purple down into the distant heather. She knew him in that way. She knew that he had changed somehow. I’ve been a shy, awkward bookworm all my life, and this is the way I know most people: from a distance, by observation, through the mutual understanding one gains simply from sharing a space. The two characters mentioned are a painter and a poet, which makes sense to me: Not only does Woolf’s description sound like a particularly writerly, painterly way of eavesdropping on the world, but it also seems to capture the relationship shared among readers and writers—a kind of intimacy through distance, the brief, deep, tangential connection you get when the same set of words runs through each of your heads. The series is a set of loosely connected stories, jumping back and forth in time. When I first read pieces of it as a teenager, I didn’t really care for it. But for whatever reason, I picked it back up in grad school and was completely blown away upon reread. There are a lot of amazing stories in Phoenix, but the one I keep coming back to is volume 2, which is about the end of mankind. The world ends in nuclear war, and one lone survivor is given immortality and tasked by the phoenix to bring back mankind. The bulk of the story is dedicated to his isolation, loneliness, and despair, but at the end he finally gets to see the re-emergence of man. Every time I read the final pages it gives me chills. 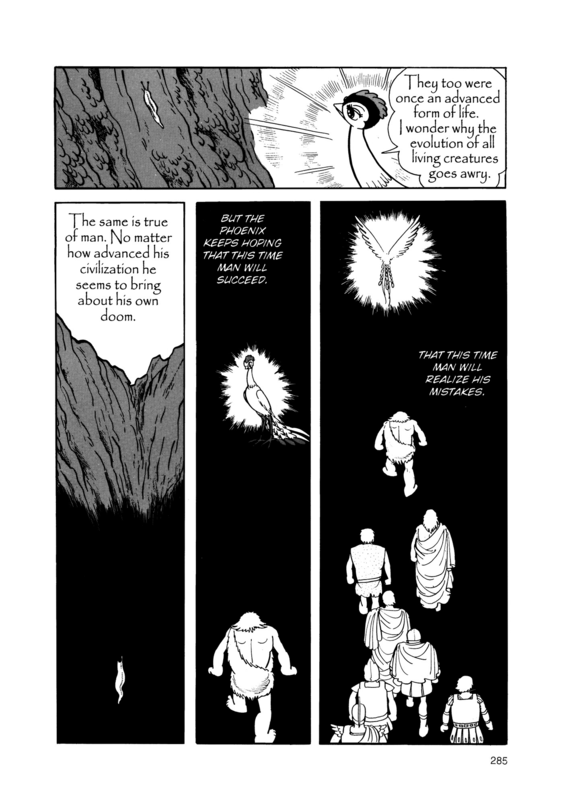 Phoenix deals so much with themes of cycles and rises and falls, and Tezuka was able to subtly inject that into the artwork and panel design. A couple of loose pages without the full weight of the story don't really do it justice, but it's a work I find myself coming back to time and time again. My 10th-grade English teacher made everybody memorize and perform this. We hated him with the heat of 10,000 suns at the time. I am now grateful. So revolutions broke out in city after city, and in places where the revolutions occurred late, the knowledge of what had happened previously in other places caused still new extravagances of revolutionary zeal, expressed by an elaboration in the methods of seizing power and by unheard-of atrocities in revenge. To fit in with the change of events, words, too, had to change their usual meanings. What used to be described as a thoughtless act of aggression was now regarded as the courage one would expect to find in a party member; to think of the future and wait was merely another way of saying one was a coward; any idea of moderation was just an attempt to disguise one's unmanly character; ability to understand a question from all sides meant that one was totally unfitted for action. Fanatical enthusiasm was the mark of a real man, and to plot against an enemy behind his back was perfectly legitimate self-defense. Anyone who held violent opinions could always be trusted, and anyone who objected to them became a suspect. To plot successfully was a sign of intelligence, but it was still cleverer to see that a plot was hatching. If one attempted to provide against having to do either, one was disrupting the unity of the party and acting out of the fear of the opposition.In short, it was equally praiseworthy to get one's blow in first against someone who was going to do wrong, and to denounce someone who had no intention of doing any wrong at all. When Neshama and I finally got up to go, I was still sad, but better. This is the most profound spiritual truth I know, that even when we’re most sure that love cannot conquer all, it seems to anyway. It goes down into the rat hole with us, in the guise of our friends, and there it swells and comforts. It gives us second winds, third winds, hundredth winds. I have spent so much time trying to pump my way into feeling the solace that I used to feel in my parents’ arms. But pumping always fails you in the end. The truth is your spirits don't rise until you get way down. Maybe it’s because this—the mud, the bottom—is where it all rises from. Maybe without it, whatever rises would fly off or evaporate before you could even be with it for a moment. But when someone enters that valley with you, that mud, it somehow saves you again. At the marsh, all that mud and one old friend worked like a tenderizing mallet. Where before there had been tough fibers, hardness, and held breath, now there were mud, dirt, water, air, and mess—and I felt soft and clean. Masquerades disclose the reality of souls. As long as no one sees who we are, we can tell the most intimate details of our life. I sometimes muse over this sketch of a story about a man afflicted by one of those personal tragedies born of extreme shyness who one day, while wearing a mask I don't know where, told another mask all the most personal, most secret, most unthinkable things that could be told about his tragic and serene life. And since no outward detail would give him away, he having disguised even his voice, and since he didn't take careful not of whoever had listened to him, he could enjoy the ample sensation of knowing that somewhere in the world there was someone who knew him as not even his closest and finest friend did. When he walked down the street he would ask himself if this person, or that one, or that person over there might not be the one whom he’d once, wearing a mask, told his most private life. Thus would be born in him a new interest in each person, since each person might be his only, unknown confidant. It’s a passage that captures, I think, some of the best parts of the internet, which are also some of the best parts of reading: the fact that one person’s thought, expressed behind a screen or a book’s bound cover, could reach countless other people, and that a stranger’s secret can somehow find its way to someone else who understands. That in the private act of reading we can share in the lives of so many others. That we all, to borrow Woolf’s phrase, can know each other in that way. So, tell us: Is there a literary passage that discloses your reality? A sentence that resonates with a major moment in your life, or simply a turn of phrase that you return to over and over? Can you quote a poem that’s shaped your philosophy, or a book that captures a feeling you’ve longed to express? Send us your favorite passage to hello@theatlantic.com and tell us a bit about why it’s been so formative.